HOLLYWOOD, Calif. – The “super fun” (Topher Gauk-Roger, CNN), visually-stunning and riotously entertaining blockbuster TEENAGE MUTANT NINJA TURTLES bursts onto Blu-ray Combo Pack, Blu-ray 3D Combo Pack, DVD and VOD December 16, 2014 from Paramount Home Media Distribution. The film arrives three weeks early on Digital HD November 25. 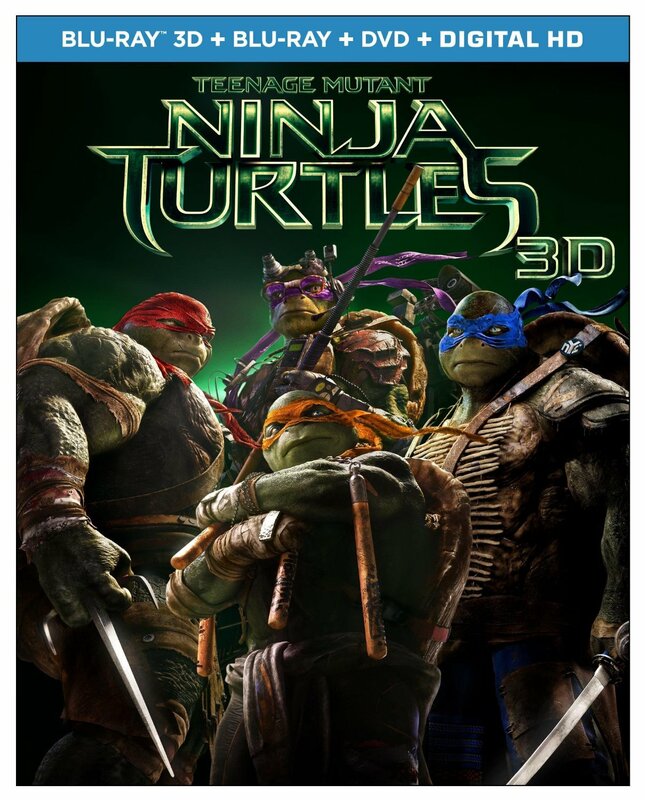 In this eye-popping reimagining of the legendary heroes in a half shell, New York is under attack by the sinister Shredder, but fearless leader Leonardo, brilliant and brainy Donatello, rough and rebellious Raphael and wild and crazy Michelangelo take to the streets to defend their home with the help of intrepid reporter April O’Neil (Megan Fox) and their brilliant sensei, Splinter. Packed with jaw-dropping action and special effects and loaded with the franchise’s signature humor, TEENAGE MUTANT NINJA TURTLES is “fun for the whole family” (Joel Amos, Movie Fanatic). The film also stars Will Arnett, Whoopi Goldberg, and William Fichtner and features Johnny Knoxville as the voice of Leonardo and Tony Shalhoub as the voice of Splinter. The TEENAGE MUTANT NINJA TURTLES Blu-ray 3D and Blu-ray Combo Packs with Digital HD include explorations of the Turtles’ latest incarnations and their sensational appearance in 3D, an extended ending, a look at the making of the hit theme song “Shell Shocked,” along with the music video and much more. In addition, specially marked Blu-ray Combo Packs include two reversible masks featuring all four signature colors of the beloved crime-fighters. Masks are available only while supplies last and quantities are limited. Select retail outlets will also offer exclusive versions of the Blu-ray with collectible packaging, premiums and more. The Blu-ray 3D Combo Pack includes all of the above, as well as a Blu-ray 3D presented in 1080p high definition with English Dolby Atmos (7.1 Dolby TrueHD compatible), French 5.1 Dolby Digital, Spanish 5.1 Dolby Digital, Portuguese 5.1 Dolby Digital and English Audio Description and English, English SDH, French, Spanish and Portuguese subtitles. Paramount Pictures and Nickelodeon Movies present a Platinum Dunes production, a Gama Entertainment/Mednick Productions/Heavy Metal production of a Jonathan Liebesman film: “TEENAGE MUTANT NINJA TURTLES.” Executive produced by Denis L. Stewart, Eric Crown, Napoleon Smith III and Jason T. Reed. Produced by Michael Bay, Andrew Form, Brad Fuller, Galen Walker, Scott Mednick and Ian Bryce. Based on the Teenage Mutant Ninja Turtles characters created by Peter Laird and Kevin Eastman. Screenplay by Josh Appelbaum & André Nemec and Evan Daugherty. Directed by Jonathan Liebesman.